The Asian Institute of Gemological Sciences (AIGS) announced today a cooperation with the Natural Color Diamond Association (NCDIA) in launching NCDIA Asia, which will be located at the Jewelry Trade Center in Bangkok. AIGS will be the natural colored diamond hub in Asia serving as a base for expanding activities for current NCDIA members, attracting new members, as well as broadening and strengthening the appreciation and understanding of natural colored diamonds to consumers in the region. AIGS President Barbara Wheat, who will head up NCDIA Asia, is the former Executive Vice President of NCDIA and is well prepared to lead the initiative. 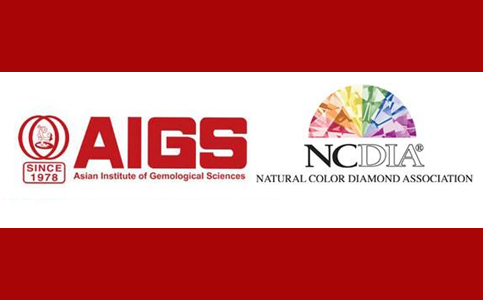 “AIGS looks forward to providing support for NCDIA in promoting natural colored diamonds in Asia, where consumers are already showing keen interest throughout the region. NCDIA’s educational efforts are in line with AIGS’s plans for increasing our work with natural colored diamonds,” Wheat said. NCDIA members will be receiving information on how NCDIA Asia will support them in the region, as well as keeping them informed about industry events. About AIGS: The Asian Institute of Gemological Sciences operates a gemological school and laboratory in Bangkok’s Jewelry Trade Center. AIGS was established by the Henry Ho in 1978 and will celebrate its 40th anniversary in 2018.